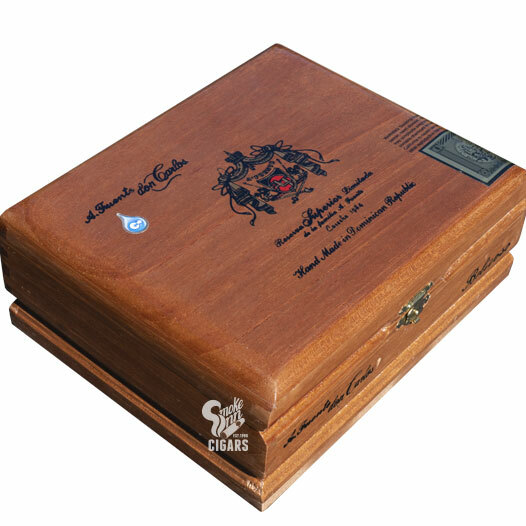 Arturo Fuente Don Carlos is named after its creator, Carlos Fuente Sr., debuting the cigar in 1976, only three years after the death of company founder, Arturo Fuente. This cigar helped to signify the next generation of cigar makers within the legendary Fuente family, being one of the company's first hits after transitioning from Cuban tobacco (due to the Cuban embargo set in 1962) to more diverse selections from the Dominican Republic, Africa, and Nicaragua, among others. Since taking over the company in 1958, Carlos Fuente Sr. always had his eyes set on building stockpiles of aged tobacco, "All our profit was always invested in tobacco. And aged tobacco is the most important thing that you can have." This philosophy was put to the test with the Don Carlos cigar, making use of vintage tobaccos throughout, many of which are aged up to 10 years. Don Carlos features a pristine African Cameroon wrapper—among the world's most sought-after tobacco varietals—placed over select tobaccos from the Dominican Republic (binder and filler). The blend is one of the Fuente family's finest, showcasing tremendous depth and balance. The cigars are medium-bodied, providing layered complexities of oak, cinnamon, maple, citrus, leather, and toasted nuts.